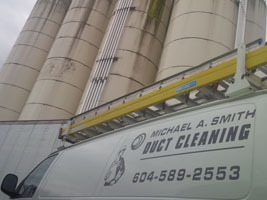 Michael A. Smith Duct Cleaning Ltd. is a leading provider of professional; HVAC systems air-duct, and dryer duct cleaning services for the Residential, Commercial, Strata and Industrial Sectors of the BC Lower Mainland Regional Districts of British Columbia. Our Vancouver duct cleaning company is locally owned and operated with a well-earned reputation for “high standard quality work and excellent customer service”. Plugged roof top vents can cause overheating of the dryer, increased energy use and water, smells traveling to other parts of the building. No job is too big and in this case, no job too tall. 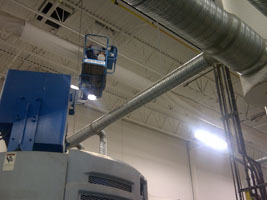 High Angle equipment and experience will safely clean these plant ducts. Our Michael A. Smith Duct Cleaning (MAS) team currently comprises 18 highly skilled technicians with support & management staff with decades of collective experience within the air duct cleaning marketplace. This experience assures effective cleaning results and unparalleled commitment to quality of customer service and satisfaction. The MAS team has an inherent understanding of the industry and the technology. We take pride in our work and use modern and powerful commercial duct cleaning equipment and industry proven methods and procedures. Our trained and very experienced Service Technicians are committed to completing each and every duct-cleaning project to meet NADCA high standards of workmanship in a safe and professional manner. This means that when there’s complex cleaning work to be completed on air ducts, HVAC systems or dryer ducts, we’re ready to meet the challenge. The experts here at Michael A. Smith Duct Cleaning work with a broad range of Strata managers, Strata Corporations and building owners to ensure all Strata building HVAC systems, dryer ducts and air ducts cleaning work is completed professionally and efficiently as scheduled. Our company also offers reduced rates when multiple units request our duct cleaning services. It’s how we help corporations across the Vancouver Lower Mainland area consolidate expenditure while enhancing building systems efficiency. Through the experienced team here at Michael A. Smith Duct Cleaning, we’re able to provide our commercial clientele with the best-value HVAC and air duct cleaning services in the business. Our Vancouver duct cleaning team has a comprehensive understanding of the challenges businesses face in effectively operating their HVAC and air duct systems, and can respond to those challenges using our experience and equipment expertise. We provide a full range of commercial HVAC and air duct cleaning services, to clean even the most complex of industrial HVAC systems with exceptional professionalism. Our expertise ensures that HVAC systems, air-ducts, air-handling units, coils & drip pans, blowers, fans, terminal units, heat pumps and all other HVAC system components are cleaned to meet or exceed NADCA high standards of workmanship and the latest industry regulations for safety and performance. The MAS team has proven project experience in cleaning HVAC systems for hospitals, institutions, schools, colleges & universities, commercial & hi-rise buildings, malls, hotels & resorts, factories, ferries, production plants and other business clientele. BC Lower Mainland homeowners require correct, professional furnace and air duct cleaning services to help protect their property and assure the safety of loved ones living inside. Our expertise ensures that dust, dirt, debris and other harmful contaminants are removed from the home’s heating and cooling system and air ducts to enhance indoor air quality and maximize system efficiency. The leading benefit to harnessing our expertise is that we can help homeowners reduce their overall duct maintenance cleaning costs and ensure that their system is in clean condition. It’s a service we’ve been offering for many years, and this experience is highlighted with each residential duct cleaning project we complete for our clientele in all regions of the BC Lower Mainland. We also provide dryer duct cleaning services to ensure the dryer duct is “clean and clear”, and general power vacuuming services to remove accumulated dust and debris from basements areas and crawl spaces. Within the industrial field, companies are required to maintain their facilities to the very highest of cleanliness and safety standards. Our service team has years of experience clearing and removing dust, debris, particulate matter, chemicals and other contaminants from the surfaces of beams & trusses, air handling units, lined & non-lined air-ducts, dust collector units, walls, ceilings, air-ducts, pipes, electrical conduit & fixtures, buss ducts, flues, coils & machinery and air duct systems. The MAS team understands the importance of maintaining systems uptime during their cleaning work and is committed to exceptional efficiency within their cleaning processes. Our full range of services is designed for industrial business leaders to support and assist in their commitment to maintaining a safe and healthy work environment. 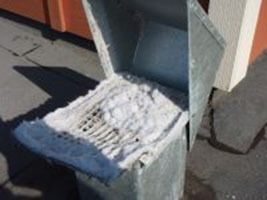 As all owners of growing Vancouver and Lower Mainland restaurants know, kitchen hood and exhaust duct systems can become exceptionally dirty very quickly, as grease builds up within the system. This presents a number of health and safety challenges in an environment where fire hazards are prevalent. Restaurant owners must maintain their business according to the NFPA (National Fire Prevention Agency) 96 standards. This means restaurant kitchen hood grease cleaning work must be completed proficiently and according to industry-mandated schedules. MAS have great experience in this area and can help ensure that these highest of industry standards are met; thereby providing a safe workplace for your team and ensuring insurance costs are minimized. Looking for the leading duct cleaning services in Vancouver and across the BC Lower Mainland? Look no further.